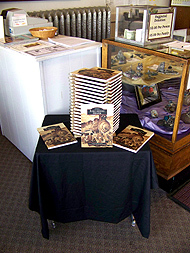 On Saturday, October 6, 2007 there was a book signing by author and Western Mining & Railroad Museum director SueAnn Martell. 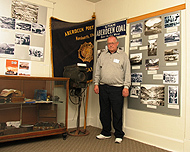 Rails Around Helper features never before seen historic photographs of the railroads and the surrounding rail towns and coal camps that made Helper great. 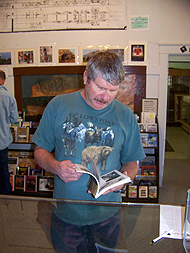 Copies of Rails Around Helper are still available at Image Replicas Mercantile. Three new exhibits also opened at the museum. "100 years of Kennilworth, Utah" tells the highs and lows of Kennilworth which started off as a tent filled coal camp and later held the largest coal tipple in the United States and a narrow Shay railroad that linked to Helper. "The Bands of Carbon County" tells the story of local bands which rose to national fame and travelled internationally. 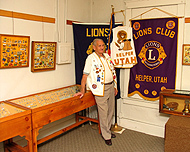 Last, but not least, Harold "Pudge" Nielson's really large life-time spanning, international collection of Lion's Club Pins entitled "The Lion's Den". For those who collect posters after events, a bandwidth friendly copy of the poster is still available for download. It is 110k and should take 2.5 minutes with a phone line, a lot less with broadband. Click here for WMRRM 3 Exhibits & Rails Around Helper book signing poster. All photos are by Darrin Teply, unless otherwise noted... this page is photo heavy and may take a few minutes to download. 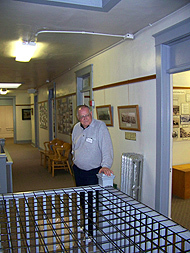 In the gift shop of the Western Mining & Railroad Museum copies of Rails Around Helper were stacked with care. 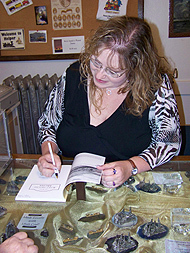 Museum Director and author SueAnn Martell was in place to sign copies of her book. Photo by Malcolm Howard. Councilman Mascaro (overseeing the museum) stopped by to give his approval of SueAnn's first book and future topics in the series. Photo by Malcolm Howard. People stopped by to get their autographed copies of Rails Around Helper. ...Old West style duels of who captures the photo first! Photo by Malcolm Howard. ...exhibit designers were upstairs greeting visitors. Harold "Pudge" Neilson's Lion's Den. An astoundingly large collection of Lion's Club Pins from all over the world spanning a lifetime of collecting! Photo by Malcolm Howard. Ron Jewkes, Kennilworth's longest living resident and "unofficial mayor" stands in his room celebrating 100 years of that town. Photo by Malcolm Howard. 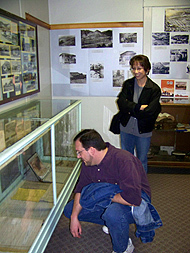 Phillip and Shawna Jensen take a look at the Kennilworth Room. While Sandy Diamainti recollects her memories of Kennilworth. 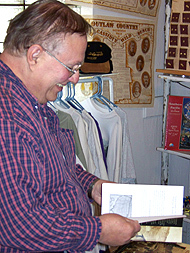 Pudge tells the history of various collections of Lion's Club Pins. Several decades worth of Lion's Club pin collecting are on display. Photo by Malcolm Howard. The Band Room celebrates the unique history of Carbon County's Bands. Photo by Malcolm Howard. 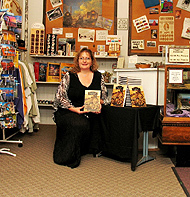 Exhibit designer, SueAnn Martell, was still downstairs signing copies of her book!